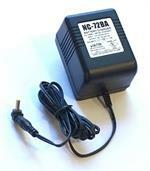 FNB-72h: 9.6 volt 1800mAh rechargeable NiMH battery pack for the Yaesu FT-817 backpacker radio. Value-priced, with good capacity; replaces FNB-72, FNB-85. This battery can be re-charged several ways: (1) Charges thru radio with NC-72 or PA-48B; (2) Charges externally with our WC-72 wall charger (plugs directly into battery and charges fully in about 10 hours); (3) Charges with the CA-72 charge adapter, hooked up to a stand-alone smart charger (that charges NiMH batteries). Dimensions: 4"tall x 2.25" across x 0.66" thick. Best value pairing is the FNB-72h battery and an NC-72BA Wall Charger. These FNB-72h battery packs are MADE IN THE USA by BATTERIES AMERICA.